This is one of the better of a series of articles I’ve been following on China’s idiotic response to the Tibet situation. The author does a good job in pointing out how China could get a whole lot of whuffie for dealing fairly with Tibet, and it would make a huge move to quell the disquiet surrounding China’s rise to a world power. Recent events in Tibet have underscored the fact that more than a Half Century of Chinese occupation—and forcible attempts to change Tibetans into Han Chinese—aren’t working and never will. Resistance to Beijing’s imperialism hasn’t come just from the “Dalai Lama clique,” as Chinese officials put it, but from all 6 million Tibetans. Thus Beijing’s problems won’t simply go away when the 14th Dalai Lama dies; he’s now 72 and very durable. But that’s a good thing, for China’s leaders are going to need his help to peacefully resolve the crisis. The Dalai Lama remains committed to nonviolence and a solution that would benefit both sides. And he’s the only person capable of persuading his people to accept such a deal. As a ninja who wouldn’t mind seeing my monkish friends enjoying their lives instead of being arrested and/or executed, I’m all for this one. This idea, on the other hand, is retarded. Far from heeding international calls for dialogue with the Dalai Lama, China has accused Tibet’s exiled god-king of colluding with Muslim terrorists to destabilise the country before the Olympic Games. State-run newspapers have issued prominent leading articles that are part of a campaign to portray the Dalai Lama as the mastermind of the deadly riots that have rippled through Tibet and ethnic Tibetan communities. In Lhasa, the Tibetan capital, yesterday local TV issued the No 7 list of those most wanted in connection with the riots on March 10 in which Chinese officials say 22 people were killed, including a baby boy burnt to death in a garage and one paramilitary police officer. C’mon China, “goodwill” is bankable. The U.S. has proved that without a doubt in the 21st Century (albeit in the negative). See chart, weep. SAN FRANCISCO — Computer intruders targeting pro-Tibetan groups, U.S. defense contractors and government agencies slipped in through previously unknown security holes in Microsoft Office, prompting Microsoft to issue a flurry of patches to the popular software suite in 2006 and 2007, according to computer security experts. These attacks, which appeared to have originated in China, began in early 2006 when the attackers started sending e-mails to victims with booby-trapped Word documents and Excel spreadsheets attached. “We are seeing more and more spying done with Trojans, a shift that has happened in the last two years,” Mikko Hyppönen, the chief research officer for software security vendor F-Secure, told RSA conference attendees Thursday morning. The Pentagon and pro-Tibet groups have previously acknowledged the intrusions, but Hyppönen is the first to link the cyber espionage to a series of patches that Microsoft pushed out without explanation. Microsoft did not immediately reply to a request for comment. Curious run of events here, as China is using regualr holes to get at the “terrorists” (i.e. “splittest” in Chinese). BEIJING (AP) — Western reporters in China have received harassing phone calls, e-mails and text messages, some with death threats, supposedly from ordinary Chinese complaining about alleged bias in coverage of recent anti-Chinese protests in Tibet. The harassment began two weeks ago and was largely targeted at foreign television broadcasters, CNN in particular. But the campaign broadened in recent days after the mobile phone numbers and other contact information for reporters from The Associated Press, The Wall Street Journal and USA Today were posted on several Web sites, including a military affairs chat site. My guess is that this is probably some slave labor camp where people are given the choice to do this or be executed. Yea, China, that’s what we think you do sometimes. “We express our strong condemnation to the deliberate disruption of the Olympic torch relay by Tibetan separatist forces regardless of the Olympic spirit and the law of Britain and France,” spokeswoman Jiang Yu said in a statement posted on the ministry website. “Their despicable activities tarnish the lofty Olympic spirit and challenge all the people loving the Olympic Games around the world,” she said in the statement. Media reports about the relay in Paris had said the security detail protecting the torch extinguished it several times along the route and retreated to the safety of a bus. But Jiang said those news reports were wrong and that the torch was never extinguished. “The reports by foreign media are false in claiming that the Olympic torch was forced to be extinguished during its relay in Paris,” she said in a separate statement. Umm, pretty much everyone is the world is reporting this factual occurrence. China is doing itself no favors with its continued insistence that nothing is wrong and everyone is happy in Tibet. April 1 (Bloomberg) — Tibetans sympathetic to pro- independence activists are planning suicide squads to disrupt the Beijing Olympic Games in August, including a plan for the Olympic torch to pass through Lhasa, said a Chinese police spokesman. “To our knowledge, the next plan of the Tibet independence forces is to organize suicide squads to launch violent attacks” around the time of the Olympics, Wu Heping, the Public Security Ministry spokesman, told reporters today in Beijing. He declined to say what measures police are taking to prevent such assaults. Tibet’s government-in-exile, based in India, said the accusation is “propaganda,” Agence France-Presse reported. Indias Foreign Minister Pranab Mukherjee has warned the Dalai Lama against any political activity damaging to Indias relationship with China.Mr Mukherjee also stressed that the exiled spiritual leader would continue to be welcome in India. The comments, which reiterate Delhi’s position, come at a sensitive time, following anti-China protests in India. More Tibet stuff coming later. There has been a rather violent confrontation including some open firing on protesting crowds. BBtv has more here, including an interview with a Tibetan activist. In this BBtv vlog episode, Xeni speaks with Tibetan human rights worker Lhakpa Kyizom about reported abuses against so-called “wired monks” in Tibet, by PRC military and police. Using cellphones, these monks photographed dead and injured participants in nonviolent, pro-Tibetan sovereignty protests that took place in March. The monks then disseminated these images to supporters outside Tibet, using connected computers and mobile devices. More traditional reporting on the events is here. Chinese paramilitary police have killed eight people after opening fire on several hundred Tibetan monks and villagers in bloody violence that will fuel human rights protests as London prepares to host its leg of the Olympic torch relay this weekend. When the inspectors tore up the photographs and threw them on the floor, a 74-year-old monk, identified as Cicheng Danzeng, tried to stop an act seen as a desecration by Tibetans who revere the Dalai Lama as their god king. The Chinese are getting a well-deserved black eye here. My prediction is that the Tibetans will adopt Palestinian tactics before China begins to budge. Hate to say it, but that’s what it is looking like. To prevent rain over the roofless 91,000-seat Olympic stadium that Beijing natives have nicknamed the Bird’s Nest, the city’s branch of the national Weather Modification Office–itself a department of the larger China Meteorological Administration–has prepared a three-stage program for the 2008 Olympics this August.First, Beijing’s Weather Modification Office will track the region’s weather via satellites, planes, radar, and an IBM p575 supercomputer, purchased from Big Blue last year, that executes 9.8 trillion floating point operations per second. It models an area of 44,000 square kilometers (17,000 square miles) accurately enough to generate hourly forecasts for each kilometer. Dharamsala, India – Jigshe Tsering spends nearly every day inside a wire enclosure outside the Dalai Lama’s residence. Like most of his fellow student hunger-strikers, who have vowed to remain inside their mock cages until China eases its crackdown, he fled Tibet hoping to find a better life close to the man who has long stood as the bulwark of Tibetan identity. But grim reports of China’s hard line against antigovernment protests that began there in March – illustrated by the poster-sized images of those allegedly killed or maimed by state forces that decorate town walls – have eroded his support for the spiritual leader’s nonviolent strategy. It’s a pretty amazing difference that leadership and culture make. In Tibet and Palestine you have two native populations oppressed by superpowers with multi-generational lengths. (Israel being a U.S. front and China being one in the making). How they have responded so far is indicative of that leadership. We’ll see how much longer they can hold out in Tibet before going medieval on some asses (my guess is until the Dalai Lama rests eternally). Does China have the right to defend itself? This photo was featured in the New York Times today. 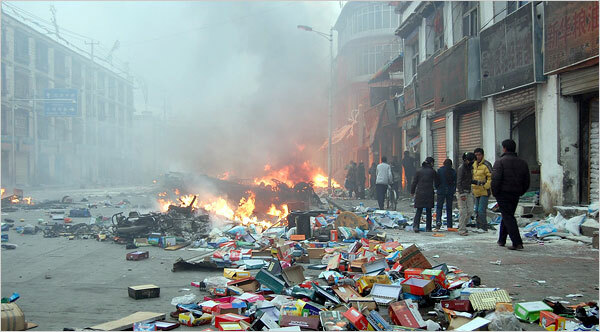 If you can’t see it, it is a photo of the debri left in the streets of Lhasa, Tibet after rioters burned chinese shop owners goods. As you know, Chinese military brutally cracked down on the unrest and killed anywhere from 20 (per Chinese official reports) to 99 (per exile Tibetan groups) people in the process. Because of this event, we have calls for boycotting the Olympics this summer, and calls from people like Nancy Pelosi to condemn China in its actions. Now, I am just a little confused here. Isn’t it US policy to condemn the occupied peoples in their revolts, to encourage passive, non-violent resistance, and to defend the occupiers for their murders of the oppressed, saying that China has a right to defend itself? Someone forgot the whole commies vs. jews argument. I think there’s a joke there somewhere, but for the moment it escapes me…like those darn emulacks of Peristronia 4. The more we crushed them, the more they slipped through our fingers. If only we’d know that was how they re-produced. Cheeky buggers. Although he describes himself as a ‘simple Buddhist monk’, last week’s events in the Tibetan plateau have underlined the Dalai Lama’s importance as a symbol of peaceful protests and a struggle for cultural freedom. For Tibetans, he is the Ocean of Wisdom, a god-king who engenders intense devotion – his name was chanted repeatedly by protesters across the roof of the world.Chinese officials have a different view, one rooted in the feeling that the Dalai Lama has used his moral and religious authority to destabilise Tibet. In an extraordinarily vituperative attack, state-run media said that the Chinese leadership is engaged in a ‘life and death struggle’ with the Dalai Lama, who is ‘a wolf in a monk’s robe, a monster with a human face but the heart of a beast’. To anyone standing in McLeod Ganj, a British Raj hill station above Dharamsala last week, where he has lived in exile since 1959, the rhetoric seems faintly absurd – a Chinese dragon scared by a mouse that prayed. Ahh, wait…so it’s the uh, “God-king”, that gets to fight the dragon, eh? The big, nuclear, 5-million-man army, err, dragon. Riiight. I’m sure he’ll be right on that. In a “monk’s second” (i.e. eternity…damn, those monks are lazy). The Tibetan government-in-exile says it can now confirm that 130 people died during the recent clashes in and around the Himalayan region.The government-in-exile, based in northern India, had previously announced a death toll of 99, while China has so far reported 19 deaths. I love the sound of “clashes” in the morning. It is still unclear what impact the crisis in Tibet will have on the prospect of talks between the Dalai Lama and China’s leaders. I love now the monks are planning on using the Olympics to piss off the Chinese. Anything that pisses off the Chinese is good, although the Chinese do make excellent pirates.